Let WildWaters introduce you to the magic and splendour that is Wabakimi! 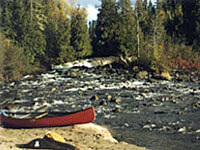 WildWaters offers a variety of Wilderness adventures in the area of Wabakimi Wilderness Park, Lake Nipigon, and the Albany River. The only full service outfitter for Wabakimi, WildWaters has been running Wabakimi trips since 1976, and was instrumental in the creation of this huge wilderness area. your hosts are Bruce and Margaret Hyer and Bill Smith.